Ashutosh Gowariker's first tryst with a story around a patriotic theme worked: Lagaan was at once riveting and moving. Abhishek might have the most loaded last name in Hindi cinema, but clearly it takes more than that to pull off a Sen. Telling stories about extraordinary idealism is filmmaker Ashutosh Gowariker's favoured forte. And it's singularly responsible for catapulting him in the league of greats. 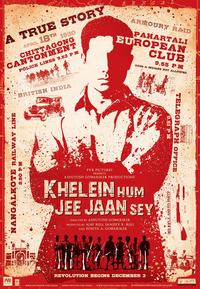 KHELEIN HUM JEE JAAN SEY based on the Chittagong rebellion is an enlightening experience of a poignant but little-known chapter in history. Adapting a work of literature into a movie is an arduous task. Based on the book Do and Die: The Chittagong Uprising 1930-1934 by ManiniChatterjee Khelein Hum Jee Jaan Sey documents a chapter from Indian history and showcases the exploits of real-life heroes. When you venture into 'Khelein Hum Jee Jaan Sey', you expect a wide canvas, spectacular visuals, sense of euphoria, high octane drama, some thrilling moments and of course apt amount of detailing. Reason being that the film comes from Ashutosh Gowariker who has to be the only contemporary film maker to have made three period/historical flicks (Lagaan, Jodhaa Akbar and now KHJJS) in one single decade.